Geological collections encompass the disciplines of palaeontology, mineralogy and petrology - since the specimens originate from rock they often suffer from the erroneous assumption that they are made of robust materials that can tolerate neglect. In fact, geological specimens can take many different forms from small to very large and most are far from robust. 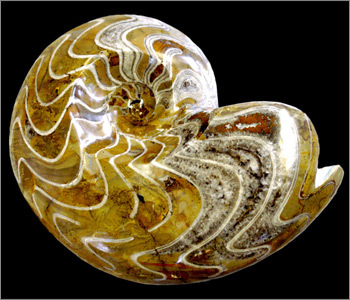 Geological specimens are also unique items and can have one or a combination of scientific, aesthetic, educational and commercial value. Many specimen types require specific environmental conditions and good physical storage conditions to ensure retention of the features of value and long term survival. Specimens that are viewed with lenses or microscopes include SEM stubs, mineralogical micromounts, micropalaeontological specimens in cavity slides, rock thin sections and polished sections for reflected light microscopy. The bulk of collections will be comprised of what is termed "hand" specimens of fossils, rocks and minerals - in other words, pieces that can be easily picked up in one hand to be examined. Large specimens could include complete vertebrate fossils in slabs or as articulated skeletons, footprint trackways, sedimentary structures such as ripple beds, large crystals assemblages and large rock specimens. Geological features can also be conserved in situ - good examples of particular stratigraphic units, structural features or palaeoecological features such as coral reefs are being scheduled throughout the UK via the county based RIGS schemes. Dinosaur trackways, a fossil forest and soft bodied Precambrian fossils are all preserved in situ in the UK, requiring particular preservation techniques. Geological materials form the ingredients for ethonographic and pre-industrial revolution pigments and occasionally the components of ethnographic and archaeological items. The products of corrosion on museum objects, especially that caused by pollutants are often of a crystalline nature and therefore often have mineralogical counterparts. NatSCA members benefit enormously from cross-disciplinary contact - for example similar microscope mountants across disciplines, paper conservation and the conservation of specimen labels and vertebrate structures from biological counterparts exposed during preparation of palaeontology specimens. A common theme across all natural science disciplines are the large numbers of specimens in collections and developing collection management techniques to ensure preventative conservation for all specimens.